The first excerpt comes from Dreamguider’s Chapter Eight, Dream Gifts for Parenting. The second is the introduction to Chapter Six. Caught up in the pressures of daily life, hurried parents forget about who their child is beneath the surface of day-to-day activity. Then, one morning, in a dream, their ten-year-old is walking with a golden retriever, her hair flowing all the way down to her waist. Or, their eight-year-old is flying with his dad to the clouds to stop the rain. Or their three-year-old is rescuing a fish from sharks to everyone’s astonishment. The dream has reminded them of the child’s spirit. Parents suddenly see their child afresh and they are renewed, often for days to come, in their appreciation for their child. Catching a glimpse of your child’s spirit through the lens of his or her dream is one of the many unsuspected gifts a child’s dreams can bring to your parenting. Dreamguider: Open the Door to Your Child’s Dreams, p.151. 2008 © by Denyse Beaudet, Ph.D. All rights reserved. Nearly every household with young children has, at one time or another, been rocked by nightmares. Panic and seeming irrationality can take over when a young person’s slumber is jarred by fright, and that fright is sometimes so untrammeled that it awakens everyone and lingers on not just for a night but for days and days. Terry’s six-year-old son had a monster nightmare so vivid that he insisted that they vacate the house, that minute. Hysterical, he tried to drag the dog and her out of the house in the middle of the night and had trouble sleeping unperturbed for weeks afterward. Such nightmares send parents scurrying to the pediatrician, to the child psychologist and to the internet and the bookshelves. For the next couple of days, with anxiety at a pitch, Terry and her son spoke about how to discourage the monster from returning. Her son, ardent in his belief that the monster was real, decided that they should “arm” themselves against it. He drew pictures of the monster, which she helped him color in. Over the pictures, they drew the universal symbol for “Not Allowed” (a circle with a line through it), then made labels for trigger-spray bottles. Together, they concocted a ghastly mixture of liquids, then filled several atomizers full of their “Monster Repellent.” She and her son deposited them strategically around the house so they would be ready to fend off the monster if it reappeared, which it did not. Whether your child abruptly awakens screaming inconsolably, or looks for you in the morning still hurting from a difficult dream, you are his or her first ally. You will find that your immediate reaction is similar to the one you would have in a waking situation, were your child threatened or hurt. The impulse to protect a child from a psychic danger is the same as the impulse to protect a child from a material danger. This impulse puts you, right away, on your child’s side, where you are needed. As a dream-time ally, you cannot necessarily “fix’ the situation. However, you can listen attentively and without dismissing your child’s dream experience, no matter how much you might be tempted to say “it was just a dream.” You can also offer to help, as Terry did, to come up with or implement whatever rectifying scheme your child conceives. 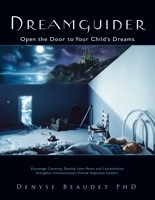 Dreamguider: Open the Door to Your Child’s Dreams, pp.95-96.